I’m not the only one who is super excited about the upcoming release of Dr. Sarah Ballantyne’s Collagen Veggie Blend from Vital Proteins! The response from you has been overwhelming and for all of you who pre-ordered, your shipment is on its way! Woot! The official release date is April 3rd, 2017 and you can still save 10% on pre-orders if you order before then! I collaborated with Vital Proteins to create this new, fully AIP, product to be something like an instant green smoothie: each serving has 3 servings of organic veggies, 1 serving of organic high-antioxidant fruit, and 20 grams of protein from grass-fed collagen peptides. There’s nothing added too, no sugars, no sweeteners, no stevia, no emulsifiers, no dyes, no flavors. Just 11 USDA organic fruits and vegetables and collagen. It stirs easily into water so you don’t need special equipment to enjoy it. And, it’s pretty impressively packed with nutrition. One serving has 21 grams of protein, 6 grams of fiber (that 25% of your RDA! ), 220% of the RDA for vitamin A (as carotenoids), 300% of the RDA for vitamin C, an impressive 35% of the RDA of folate, 15% of the RDA for potassium, and 10% each of the RDA of calcium and iron… all for 150 calories and 7 grams of sugars all naturally-occurring in the included fruits and vegetables. 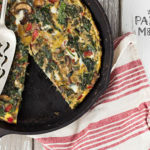 It’s designed to be a nutrient-dense AIP on-the-go food and a super easy way for anyone who struggles to eat enough veggies to hit their 8-a-day minimum! 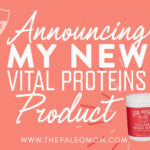 Read more about the product and the collaboration in Announcing My NEW Vital Proteins Product! The number one question I’ve been getting is why the $79-price tag for a 22-oz tub? Quite simply, there’s a whole lot in a tub, the equivalent of about $50 in fresh organic fruits and veggies plus a 10-oz tub of Vital Proteins Collagen Peptides which retails for $25, not to mention the time-savings and convenience of a shelf-stable powder that stirs nearly instantly into water. 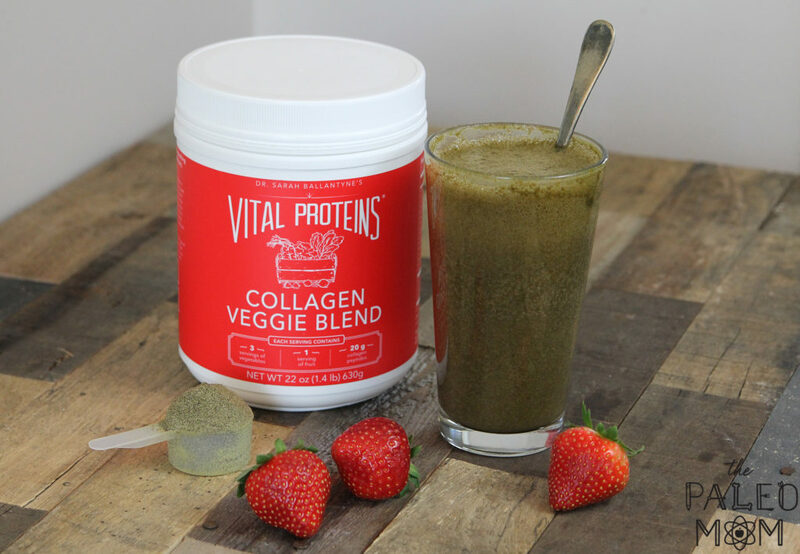 If you’re interested in this breakdown, I’ve shared the details in DIY Collagen Veggie Blend. 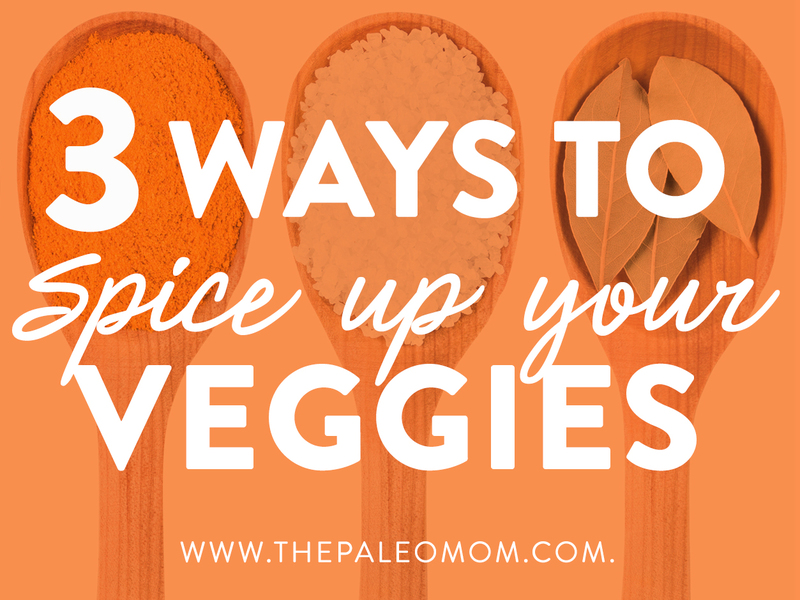 But, here’s the reason for sharing this recipe: my number one goal is to make getting enough vegetable servings per day for optimal health as easy as possible for you (see The Importance of Vegetables) along with the health benefits of collagen (see Why Broth is Awesome). 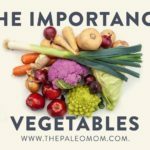 And, while I clearly benefit if you purchase Collagen Veggie Blend, I care more about making healthy food choices as accessible as possible. So, here’s the exact recipe so you can make your own! 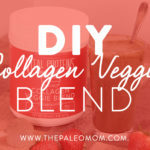 To make your own Collagen Veggie Blend, you’ll need a high-powered blender like a Blendtec or a Vitamix (most inexpensive blenders aren’t up to the task of blending raw carrot into a completely smooth smoothie). I also made the assumption that you’d prefer to use regular cherries as opposed to purchasing freeze-dried acerola cherries, although if you do choose to purchase this superfood ingredient (one of the top food sources of vitamin C and very high in phytochemicals! ), you’ll need about 3/4 teaspoon. Also, just like Collagen Veggie Blend, this drink is not sweet. There’s just enough fruit included to offset the bitterness of the veggies. I think it’s tasty on its own (note, I really love plain veggie juices with no fruit ingredients), but if it’s not sweet enough for your liking, try adding half a banana, a teaspoon of honey, or half an apple. Combine all of the ingredients into a blender and blend on high, or with smoothie function if your blender has one, until completely pureed. Want to keep it simple and just buy a tub of Collagen Veggie Blend? Click here and save 10% when you order before April 3rd, 2017. 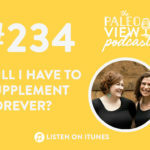 TPV Podcast Episode 234, Will I Have to Supplement Forever? I don’t suppose you have weights (as opposed to volumes) for your smoothie recipe ingredients? I find using a scale MUCH easier; t’s hard to measure berries and broccoli in such small volumes. I plan on possibly adding some banana for sweetness and almond butter for texture and additional protein. I get it that the ingredients are expensive; I just wonder if you are making this on a large scale then shouldn’t the cost come down significantly? It is unfortunate that staying healthy these days can be expensive considering the costs of the various supplements and vitamins etc. We need all the help we can get in trying to keep some of these costs down. Having said this, congratulations on coming up with such a wonderful product. I’ve been following you and reading your books for several months now. You have given me so much valuable information. Thank you! I preordered and received your favorites pack. I have yet to try the beef gelatin and the collagen peptides. Although, I did try the veggie blend, and I don’t think I like it. It’s very gritty and didn’t mix well in the supplied mixing bottles that came in the box. What else can I do with it to dissolve it better? I would love some expert advice. Thanks so much! I use an immersion blender, works great. This is awesome! 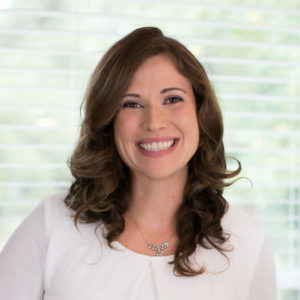 I’m really wanting to add collagen to my diet but am sensitive to beef (at least for now)…I know the healing benefits of collagen and am wondering if it could have the opposite effect? I’m hesitant to add it into my diet but really want to. 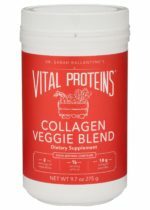 Vital proteins sells a collagen that comes from fish bones. This may be a good option if you don’t tolerate beef. Thanks so much for sharing this recipe! I am always looking for new ways to increase the family’s veggie intake. This seems like a great and tasty way! I love that there are more ways to get healthy than just using a fitbit! Just got my order can’t wait to try it out. Couple of questions: My ALCAT test says i have mild intolerance to beef, since this collagen is beef based do you foresee issues? not sure bones are different than the actual beef meat itself there. Also, assuming no issues, could I drink this twice a day to really hit 8 veggie servings per day or would that be too much? I have a question not related to the post. Is it bad in any way to drink collagen with meals, if the meal protein source is for example fish? 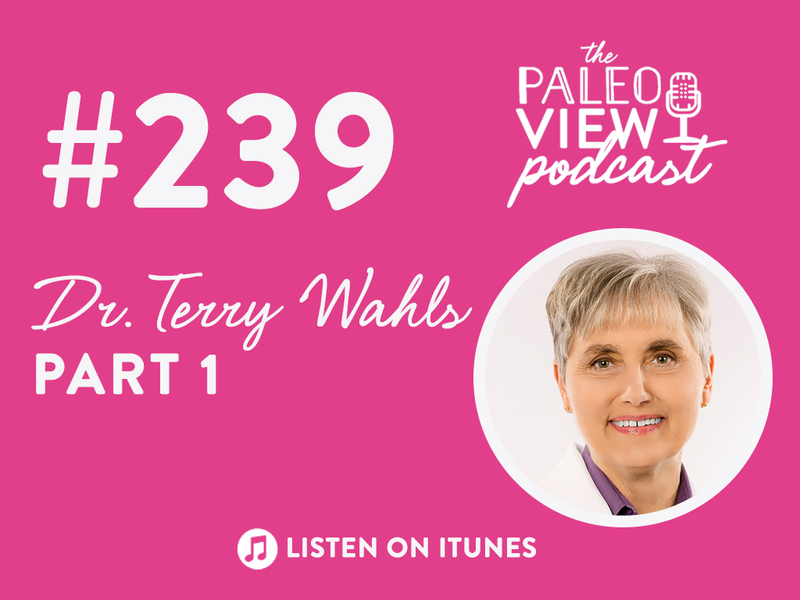 Will the proteins “interfere” and maybe make digestion harder? The same with broth, can I drink for example beef broth when I eat fish? Sounds delicious…and also extremely extremely expensive! To make that drink, one would need to spend upwards of $60 (organic berries are so expensive I consider them luxuries). Hello, wondering what isa suggestion to get my 5 year old daughter to try this and what would be a good amount for her serving? I’m trying to find new things to incorporate in to our family change in diet and lifestyle due to her diagnosis of juvenile dermatomyositis. Thank you. I’d try putting it in a smoothie for her. My girls like it mixed with banana, cocoa powder and coconut milk. One scoop would likely be a good serving size. What are the vitamin k and magnesium values? They aren’t listed on the supplement facts. Thanks!